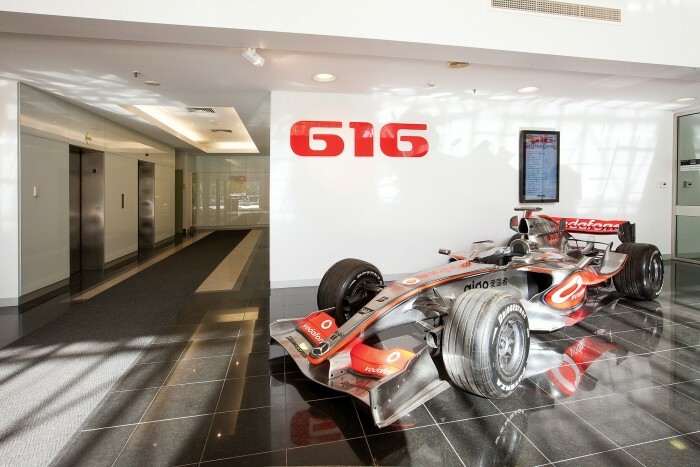 Australian Grand Prix Corporation | Office Fitouts & Construction by ODC. ODC Design was appointed by the Australian Grand Prix Corporation in September 2011 to undertake a review of 2 potential buildings on St.Kilda Rd Melbourne. We undertook a space planning based on the client brief to review which location best suited their organisation. AGPC finally decided on Level 5, 616 St.Kilda Road where the project involved space planning, design, documentation and construction of a large boardroom, 6 meeting rooms, 1 large staff break out, kitchen (located off the boardroom), 75 workstations and 12 offices, the project was completed in May 2012. Motor racing is the nature of the business, the brief was to create a dynamic, racy and memorable space for the client and we achieved this by using industrial, edgy finishes and materials with the collaboration of Grand Prix’s motorbikes and racing display merchandise.